Fear of upsetting the neighbours is preventing many parents letting their children play out, a survey suggests. More than a quarter (28%) of 1,000 UK parents questioned feared being judged by neighbours if they let their children play unsupervised outdoors. Almost a third (32%) believed allowing their children to play ball games or make noise outdoors would cause problems with other residents. The poll was released to mark Playday 2013, an annual campaign for play. One Poll surveyed 1,000 children between five and 16 years old and 1,000 parents with children the same age. Of the five-11-year-olds, 53% said they would like to play outside more, while 40% said they could do so as much as they liked. Of all the children, 13% said adults where they lived tended to disapprove of them playing outside, while 10% said adults thought they were up to no good when they were with friends. Of the adults, 53% thought traffic was a barrier to children playing out where they lived, 40% cited "stranger danger" as a concern and 28% said intolerant neighbours were a problem. A quarter of the adults felt a more friendly community and better relationships with neighbours would encourage young people to play outside more often. A lack of dedicated community space was also cited as hampering children's opportunities to play, with 32% of the adults and a fifth of the children saying more spaces to play within their local community would get more children playing out. The research suggests play has the power to bring communities together, with 40% of adults saying children playing out where they lived improved community spirit, and 45% saying it helped families get to know each other. And 60% of parents said they would feel confident letting their children play in the street if others were playing out too. Cath Prisk, director of Play England, said: "It's up to all of us to turn around the creeping disappearance of children from our streets, parks and communities. We all have role - as families, neighbours, and friends. "We can all do something to say we love kids playing outdoors, that we want to live in communities that actively welcome kids playing out. "There always was and always will be some people who want to squash kids' fun - but there are far more that really want kids back outside playing, not stuck indoors, especially over the summer holidays." Jacqueline O'Loughlin, chief executive of Play Board Northern Ireland, said: "Consensus is spreading - play, especially playing outdoors, makes sense. It makes sense for families, society and the economy. 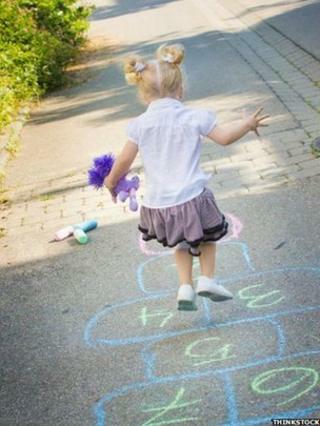 Play is fundamental to our children's enjoyment of their childhood, it can't be taken for granted. "All of us, from parents to planners, from neighbours to policy makers have our part to play in allowing and supporting children's play as it is vital for our children's health, learning, development and happiness." Mike Greenaway, director of Play Wales, said: "We need to recognise the importance of providing children with time, space and freedom to play in their own way. "We need to support them and recognise that for their health, wellbeing and long-term development children need playful places and opportunities to play outside." Marguerite Hunter Blair, chief executive of Play Scotland, said: "As well as a celebration of children's right to play, Playday is a campaign that highlights the importance of play in children's lives. "We know that children across the UK would like to play outdoors more than they already do, with more opportunities for a wide range of play opportunities wanted." Playday - held annually on the first Wednesday in August - is run by Play England, Play Board Northern Ireland, Play Wales and Play Scotland and aims to raise awareness of children's right to play and the importance of play for their health, wellbeing and happiness.